Looking for things to do in York? - YORKTOUR can help. The history of York is the story of England in stone, wood and chocolate. Western Christianity was born here, so was the KitKat. No other place in Britain preserves so much of the country's past in such a concise area. From the Romans to the Vikings and the Railways, the streets of York are a living picture book of 2000 years of history. Perhaps the most authentic way to visit York would be on horseback. Failing that, York remains a compact, medieval city best explored on foot. We will guide you through the ancient streets, hidden alleys and secret corners that couldn't be experienced from the top of a bus (or a horse, for that matter). There’s an overwhelming amount of things to do in York. It is a city overflowing with museums, monuments and attractions. But why not let the streets speak for themselves? They have a lot to say. In most places, the past lies buried. Not in York. Here the past is alive and present, sometimes in ruins, but still above the ground. Visit York and let us lead you through the maze. Though the Romans planned York in regular straight lines, by the Middle Ages it had all become a bit of a muddle. But we can show you all the key points of interest in a walk around the medieval heart of York. 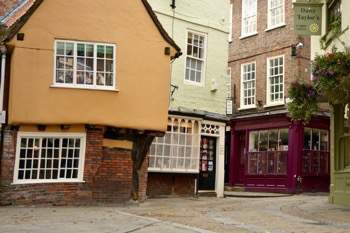 Not only world-famous streets such as the Shambles, but also the secret short-cuts and hidden passages (‘Snickleways’ we call them here) where, if you’re not lost, you must be local. York is a very walkable city. The distances are not great, and there are no hills. The medieval centre is contained within a ring of stone walls designed to defend the original York Castle, which have kept enemies out and the spirit of the city in for over 800 years. You can make a complete circuit of these ramparts in under an hour. It’s not an experience that can be gained from an open-topped bus. Whether you have an hour, an afternoon or a whole week to spend, we want you to make the most of your time in this inspiring city. 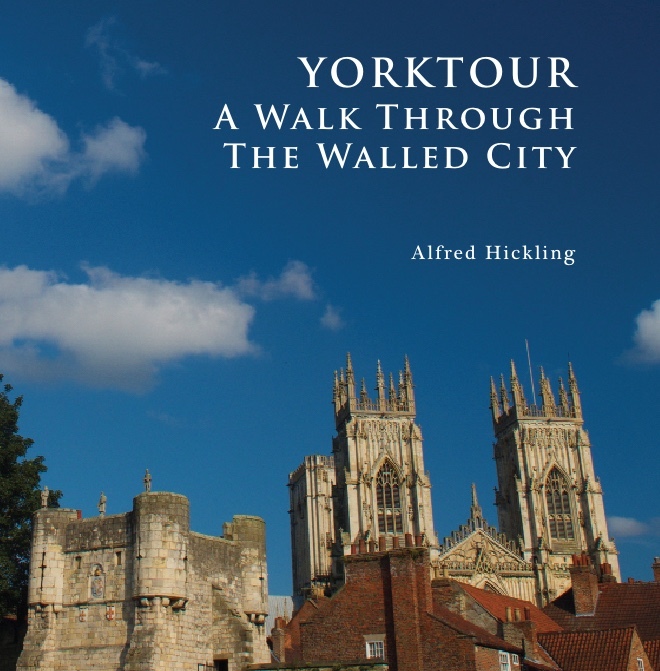 YORKTOUR is the longest-established walking tour company in York and has been welcoming visitors to the city for over forty years. Our friendly, informal guides aim to assist you with their local knowledge rather than bombard you with facts. We can provide a range of languages including French, German, Italian, Spanish and Portuguese. All YorkTour guides are qualified to take visitors into the cathedral. All Yorktour guides live in the city. Most of us were born here. We’re passionate about the place, and our tours are designed to reflect this. With Yorktour, you don’t just get the services of a historian. You get the company of a friendly inhabitant who loves showing visitors round town. Yorktour was founded in 1974 and is the oldest, continually running tour operator in the city. It was initially set up by coach-hire company Eddie Brown, and still provides a loyal service to the many visitors, British and foreign, who make coach excursions to York. The company was subsequently bought by Stephen Lusty, a highly experienced guide, fluent linguist and former chairman of the Yorkshire Philosophical Society, who greatly expanded the company’s business and profile. Now the company continues to evolve with the appointment of two new directors, whose aim is to provide the same great service while creating a twenty-first century context for York’s ancient past. Our most popular introduction to the city - 2000 years of history in a two hour walk. 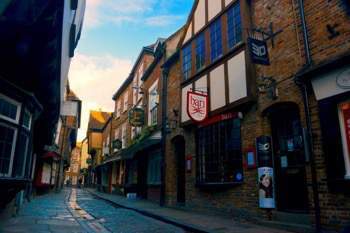 The route includes all the key sights, including the Minster, the Shambles and the city walls; though we will also lead you deep into the medieval maze to reveal secret corners you might otherwise have missed. In town on business? Only free after 6pm? 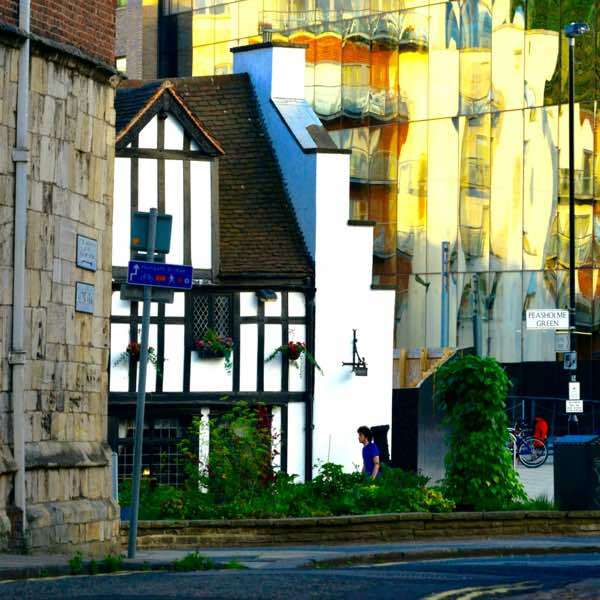 York appears at its most magical around sundown, and though there are many ghost-walk options, this tour focuses on sights rather than frights. Authoritative, engaging and 100% phantom-free. If you have more time to spend, we can arrange half-day, whole-day or even whole week packages tailored to your interests or requirements. From photography tours to textile trails we can provide guides who speak French, German, Italian, Russian and Mandarin with other languages available on request. York has the most extensive set of medieval fortified walls in the country (to give Chester its due, theirs are more complete, but ours are longer). A few small sections fell prey to Victorian developers; and there’s a stretch that never had a wall as there was an impassable marsh instead. But otherwise the walls form two and three-quarter miles of glorious, yellow limestone with astonishing stories every step of the way. There’s no better way to get the measure of the city than by tracing its perimeter. The views are breathtaking; and there are some fabulous cafes and remarkable museums tucked into the turrets along the way. 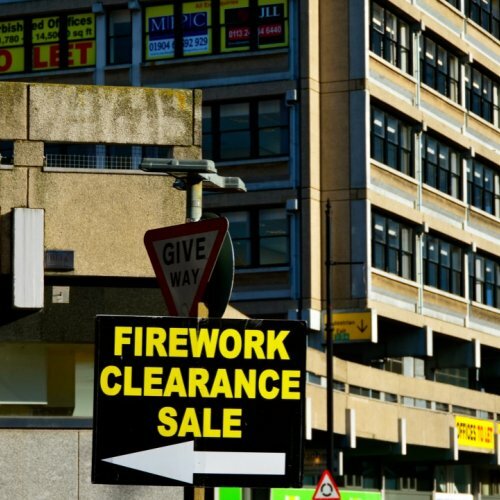 Never mind the history - where are the shops? 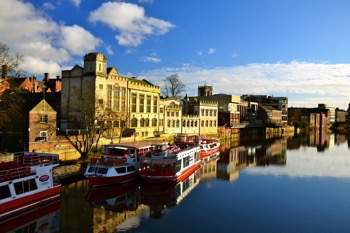 York has its full complement of high street stores and chain restaurants. Anybody can find those. But the incredible array of specialist, independent shops is what gives the place its character. And because we live here, we know where they are. The true delight of York is that you don’t have to make a choice between history or shopping - it’s all in the same place. Some of the city’s most quirky medieval buildings are also its finest fashion stores. Even the Shambles is full of some highly recommendable craft stores and tea rooms. Along this crooked, cobbled street are two brilliant bakeries and a shop selling the best sausages in York. The kids may recognise it as the place where Harry Potter bought his wand. Remarkably, it’s a real street rather than a tourist trap, where local people actually do their shopping. And to buy a pound of sausages from the medieval street of butchers - what could be more historically authentic than that? Please note: York Minster makes a separate entrance charge for visitors, though our guides are qualified to take you round the cathedral. Please enquire for further details. 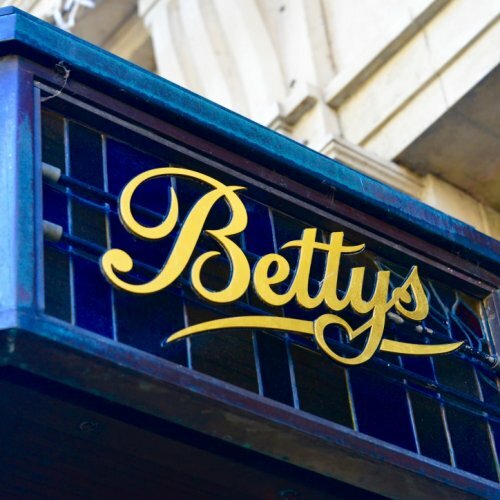 Bettys hits one hundred. The diet be damned. Hudson House has gone. Will anybody miss it? Q: How long is the average tour? A: As long as a piece of string - Yorktour is a bespoke, personal service and we will devise an itinerary to match your requirements. But two hours is a sufficient length of time to see all the key sights and places of interest. Q: What time are the tours? A: Whenever you’re ready. We don’t run scheduled daily walks - it is a personalised, pre-booked service for groups or individuals. Q: What is the itinerary? A: That depends where you would like us to meet you, either at a designated landmark in the city centre or at your hotel. But a good place to start is Exhibition Square where 2000 years of York’s history is visible from one spot. Q: How far will I have to walk? A: Again, that’s entirely up to you. But York is a compact city, and as a rough rule of thumb, two hours at a gentle pace would cover approximately a mile-and-a-half. Q: Can you walk along the city walls? A: Yes! It’s one of the very best ways to get to know the city, as well as providing some of the most spectacular photo opportunities. The complete circuit of the walls is 2-and-three-quarter miles. But the quarter-mile stretch between Bootham Bar and Monk Bar takes twenty minutes and is the most picturesque portion if you only have time to see part of it. A: Bring an umbrella! We never cancel due to adverse weather conditions. The extremes of British climate have been known to make the experience more memorable. (Please note, however, that the raised walkway along the city walls is closed if it becomes icy). A: We can provide guides who speak French, German, Russian, Italian and Mandarin - for other languages please enquire. We are also experienced at running tours in clear, uncomplicated English specially designed for language students. Q: Are admission prices included? A: No. The Minster has an entrance fee of £10.00 per person (or £8.50 for groups of ten or above) which needs to be paid by cash or card on entry. All of our guides have completed the Minster’s accredited training course and are qualified to take visitors round the cathedral. Q: How long should I allow to see the Minster? A: A lifetime, if we’re honest; about an hour, to be realistic. Q: What if I, or a member of my party, isn’t very mobile? A: Because Yorktour is a personal service rather than a prescribed route we can concentrate on a step-free, concise area. For example, there’s a huge amount of York’s story to be told within the Museum Gardens - a beautiful botanic garden of only a few acres right at the heart of the city. Q: Is shopping time included? A: Absolutely, if that’s what you want. York is full of unique independent businesses and we know where all the best ones are. But the great thing about York is that you don’t have to make a choice between shopping or sightseeing - it’s all in the same place! Some of the finest old buildings now contain the best shops and restaurants. Q: Can pets come too? A: As long as you don’t want to go inside the Minster or onto the city walls, we’d love to meet them! Click on the image above to preview our guide book. Die Geschichte York's ist die Geschichte England's, geschrieben in Holz, Stein und Schokolade. Sowohl westliches Christentum als auch KitKat's stammen ursprünglich aus York. Die Stadt wurde von Römern, Wikingern, Normannen und den Eisenbahnbauern erschaffen. Herz der Stadt ist das York Münster, Nordeuropa's grösste, mittelalterliche Kathedrale. York ist einzigartig und umgeben von Steinmauern, welche die Stadtmitte seit mehr als 800 Jahren beschützen. Es ist der einzige Ort der ihnen im selben botanischen Garden eine römische Festung, die Ruine einer Abtei und ein Observatorium aus dem 18. Jahrhundert anbieten kann. Der weltberühmte Shambles Weg ist Harry Potter Fans sofort als Vorbild für die Winkelgasse erkennbar. Yorktour ist die am längsten etablierte Stadttourfirma in York und empfängt seit mehr als vierzig Jahren Besucher. Unser aus leidenschaftlichen und kenntnisreichen Fremdenführern bestehendes Team ist in diversen Sprachen gewandt. Wir empfangen Urlauber, Konferenzdelegierte, Schul- und Bildungsgruppen. Treten Sie bitte in Verbindung mit uns um ihre Bedürfnisse zu besprechen. Wir hoffen sie bald in York zu sehen. 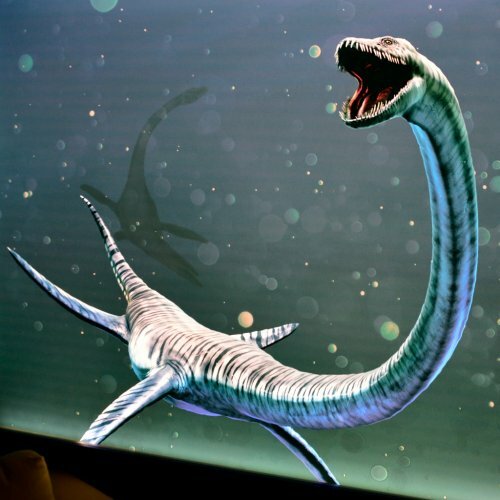 York'un hikayesi, İngiltere'nin ahşap, taş ve çikolata üzerine kurulmuş hikayesidir. Batı hristiyanlığı da, KitKat çikolatalarının da kökeni burasıdır. Romalılar, Vikingler, Normandiyalılar ve demiryolu işçileri bu şehri kurmuştur. 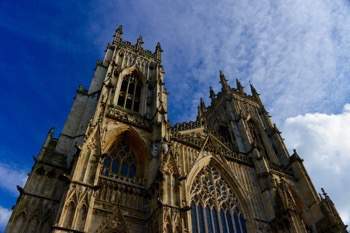 York'un merkezinin kalbi, Kuzey Avrupa'daki en büyük katedral olan York Minster'dir. York'un eşi benzeri yoktur ve şehir merkezi 800 yılı aşkın süredir taş surlar tarafından korunmuştur. Botanik bahçesinde aynı anda Romalı hisarı, manastır kalıntısı ve 18. yüzyıldan kalma rasathane sunabilen yegane şehirdir. Dünyaca ünlü Shambles sokağını Harry Potter hayranları anında Diagon Yolu diye tanıyacaklardır. Yorktour şehirdeki en köklü tur şirketidir ve 40 yılı aşkın süredir York'a gelen ziyaretçileri ağırlamaktadır. Becerikli ve bilgili rehberlerimizden oluşan ekibimiz, çeşitli lisanlarda hizmet sunabilmektedir. Gezginleri, konferans katılımcıları, okul ve eğitim grupları için turlarımız mevcuttur. Gereksinimleriniz için lütfen bizimle bağlantı kurun. Sizi en kısa zamanda York'a bekliyoruz. YorkTour – la compagnie qui parle votre langue! L'histoire de York est l'histoire de l'Angleterre marquée dans le bois, la pierre et le chocolat. Le christianisme occidental est venu d'ici; le KitKat aussi. C'est une ville créée par les Romains, les Vikings, les Normands et les constructeurs de chemins de fer; et à son cœur se dresse Minster, la plus grande cathédrale médiévale du nord de l'Europe. York est unique, entourée de murs de pierre qui ont protégé le centre historique depuis plus de 800 ans. C'est le seul endroit où vous pouvez voir une forteresse romaine, une abbaye en ruines et un observatoire du 18ème siècle dans le même jardin botanique. La célèbre rue Shambles est immédiatement reconnaissable aux fans de Harry Potter comme le modèle du Chemin de Traverse (Diagon Alley). YorkTour est la plus ancienne compagnie de circuits pédestres guidés de la ville. Elle accueille les visiteurs de York depuis plus de quarante ans. Notre équipe de guides-interprètes est formée de professionnels qui parlent plusieurs langues. Nous accueillons vacanciers, délégués de conférences, visites scolaires et autres groupes éducatifs. Contactez-nous pour discuter de vos besoins. Nous espérons vous voir très bientôt à York! Yorktour - la empresa que habla tu idioma! La historia de York es la historia de Inglaterra en madera, piedra y chocolate. El cristianismo occidental vino de aquí; como lo hizo el KitKat. Es una ciudad creada por romanos, vikingos, normandos y constructores de ferrocarril; y en su corazón, el Minster es la catedral medieval más grande del norte de Europa. York es única, rodeada de muros de piedra que han protegido el centro histórico durante más de 800 años. Es el único lugar donde se puede ver una fortaleza romana, una abadía en ruinas y un observatorio del siglo 18 en el mismo jardín botánico. Ahí también los fans de Harry Potter pueden reconocer al famoso Shambles como el modelo de Callejón Diagon. Yorktour es la compañía de visitas guiadas a pie más antigua de la ciudad. Lleva recibiendo a los visitantes de York más de cuarenta años. Nuestro equipo de guías apasionados y conocedores hablan diferentes idiomas. Damos la bienvenida a los turistas, delegados de conferencias, grupos escolares y grupos educativos. Por favor, ponte en contacto para comentar tus necesidades. ¡Esperamos verte pronto en York! Yorktour - parliamo la tua lingua! Parlare della storia di York significa parlare dell'Inghilterra del legno, della pietra e del cioccolato. È la storia della cristianità occidentale e del KitKat; la storia di una città creata dai romani, dai vichinghi, dai normanni e dai costruttori di ferrovie. Una città con al suo cuore la Cattedrale - la York Minster - la più grande cattedrale medievale dell’Europa settentrionale. L’unicità di York è protetta dalle mura in pietra che circondano il centro storico da oltre 800 anni. È l'unico posto dove sia possibile vedere una fortezza romana, le rovine di un'abbazia ed un osservatorio del 18o secolo all'interno dello stesso giardino botanico. E poi The Shambles, la famosa strada che i fan di Harry Potter conoscono come ciò che ispirò Diagon Alley. Da oltre quarant'anni, Yorktour organizza tour guidati della città di York. La nostra squadra di guide turistiche - esperte ed appassionate - è in grado di fornire tour in diverse lingue. Accogliamo ogni tipo di visitatore: dai turisti alle scolaresche ai viaggiatori d’affari. Contattaci e discuteremo insieme di tutte le tue necessità. Speriamo di vederti presto a York!